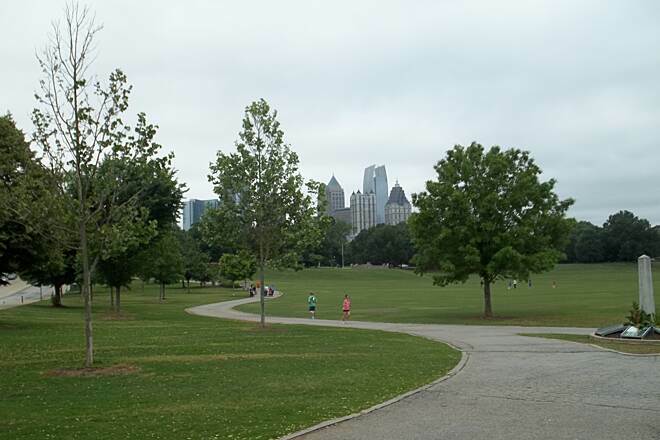 Next to the Beltline trail,the park has restrooms,parking,childrens playground,play lawn,and a skateboard park. 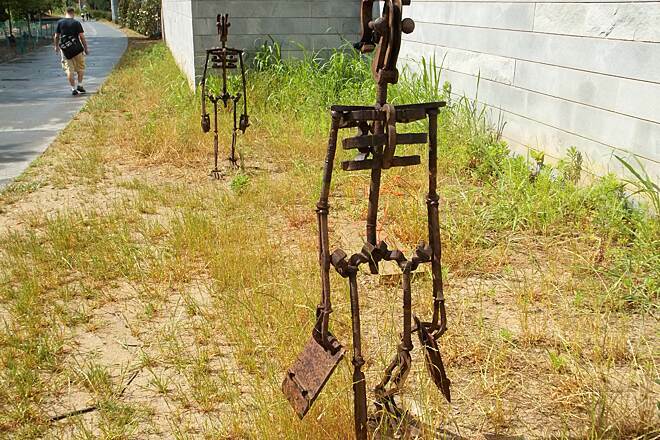 These modern art track workers are made of track bolts,spikes,rail anchors and tie plates. 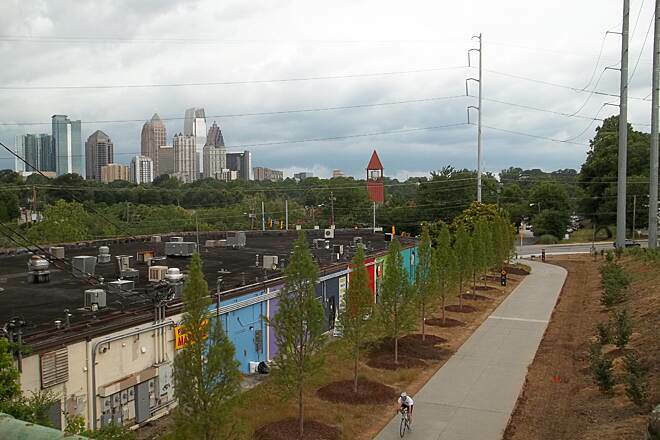 This is the temporary north end of the Eastside Beltline trail At Monroe Drive and Tenth St.The Midtown Atlanta skyline is in the background. 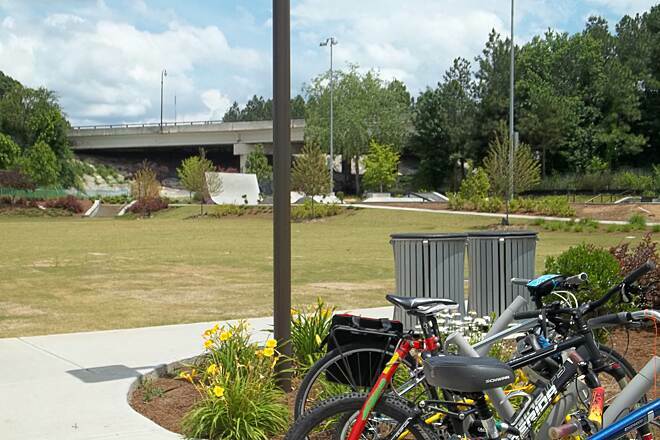 The Eastside Beltline trail temporarily ends at Monroe Drive and Tenth St. At this intersection,you can travel west on the Tenth St. sidewalk to the entrance of Piedmont Park.the park has an extensive network of beautiful multi-use trails. 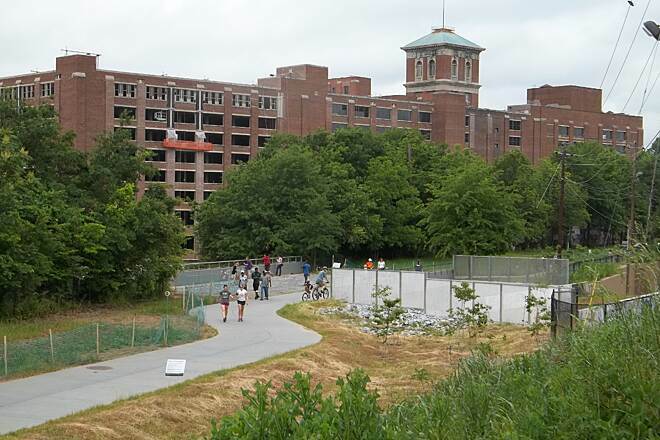 Old Ford Factory near Ponce De Leon Ave. 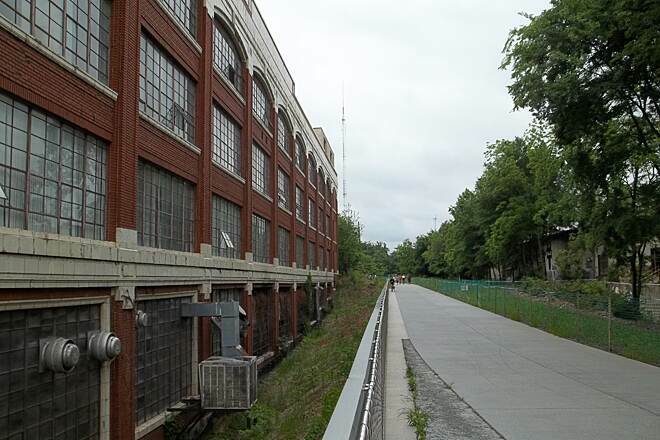 This building was a Ford Factory and was also called the war assets building.It has now been preserved as a multi-use building. The old Sears and Roebuck building is trailside between North Ave. and Ponce De Leon Ave.The basement and first floors were retail space. 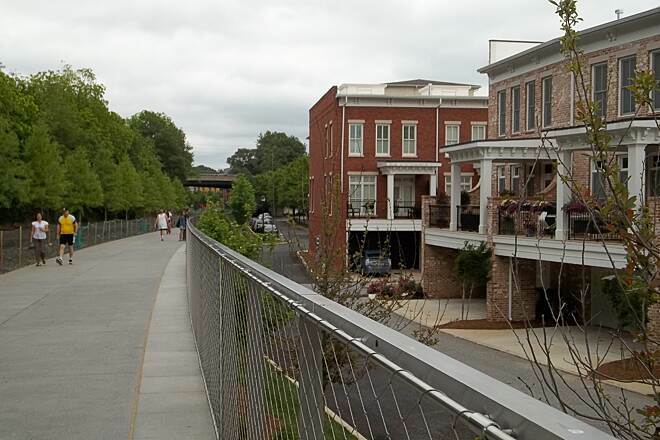 The rest of the building was warehouse and catalog sales.The building is currently being renovated for multi-use. An old piece of track on the Ralph McGill Blvd. 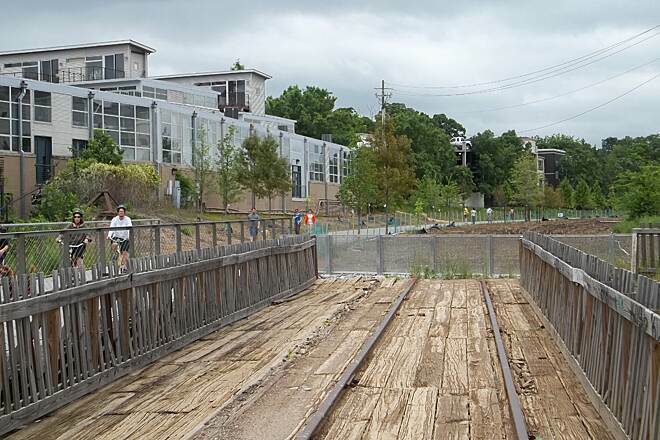 overpass.The Atlanta Beltline Railroad connected the railroad yards of the L & N,Southern Railway,Central of Georgia,Atlanta and West Point,Georgia,and Seaboard Coast Line railroads. 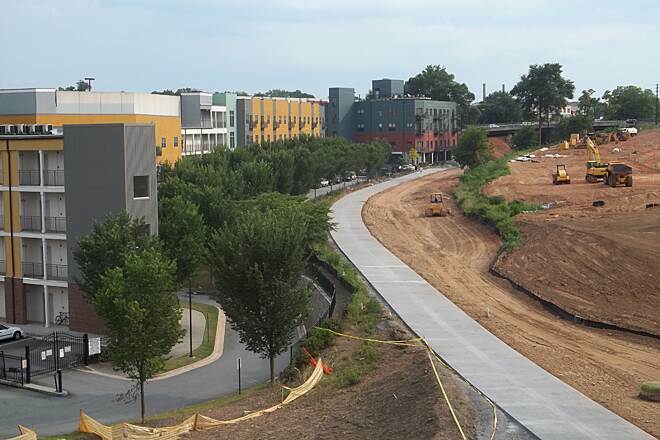 The Eastside Beltline Trail becomes reality in late summer of 2012.Also, a sidewalk trail connects the Eastside Beltine Trail with the Freedom Park Trail at this location. 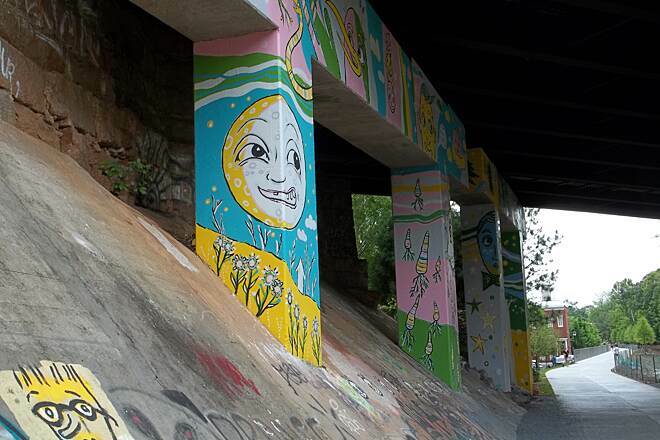 Whimsical street art adorns the North Highland Ave. bridge. 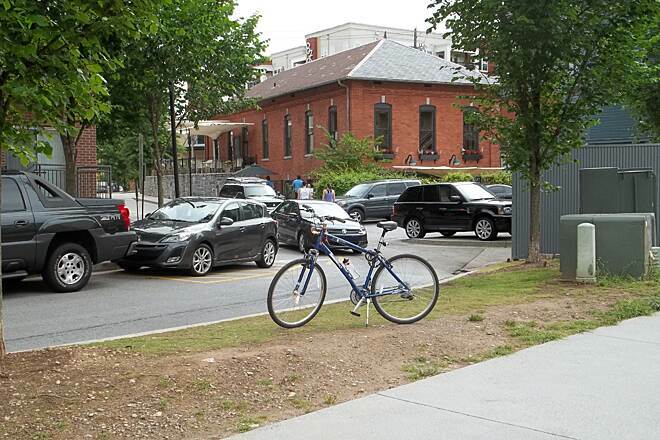 A classic old red brick industrial office finds new life trailside as a trendy new restaurant near North Highland Ave.
Beautiful condos trailside south of North Highland Ave.